I often spoke to my friends about our wartime memories. I felt that it was something people had an urge to talk about. I can picture him. Sitting in the room staring at the keyboard. Recalling wartime memories. I can picture him trying to figure out if those are actual memories or if he has recreated in his mind stories that he had heard elsewhere. I can picture him. Presenting the idea to collect memories of the war generation. The lost generation? So, he asked young people who grew up during the war in Sarajevo to put their memories on paper and send it to him. He planned to write a book, mapping the war from children’s perspectives. It became War Childhood: Sarajevo 1992 – 1995. It was January 2013. The name everyone in Sarajevo was talking about is Jasminko Halilović. Born in 1988, he was 4 years old when the war started. His first memories were dictated by the war that held his city under a siege for 1,425 days. In that time, 1,600 children were killed. The memories are what remained, and a society torn apart. I first heard about Wartime Childhood when Halilović came to the radio station. I saw this young, quiet guy. He would keep his hands behind his back while talking or touching the fingertips of one hand with another. Like he’s always aware that his hands could be a distraction from what he’s saying, and he wanted people to listen to him very carefully. I didn’t know what he talked about with a colleague of mine, but it was only some months later when I held his book in my very own hands that I realized what he had done – and more so, that he has done in his mid-20s. How did these other children get to live my life? Most of the bulletinlike stories that I’ve read pierced like arrows to some points of my time growing up during wartime. 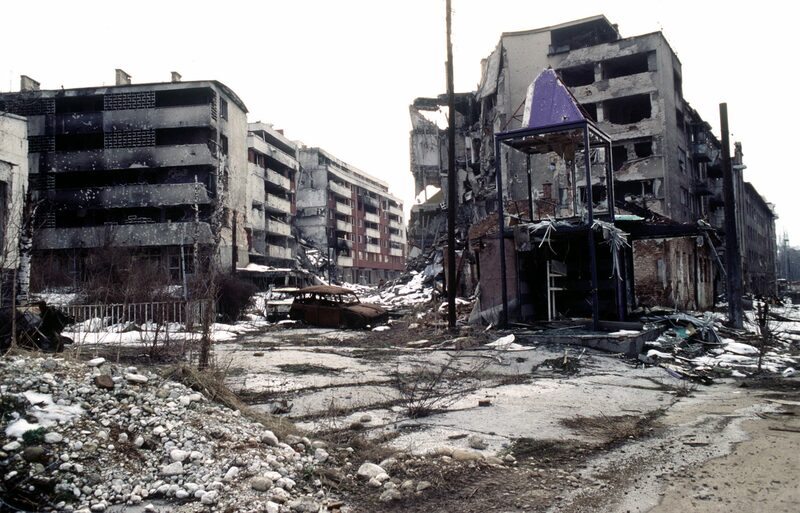 From April 1992 to February 1996, Serbian troops besieged Bosnia’s capital Sarajevo. Between 300,000 and 400,000 people were trapped in the city, districts like Grbavica (pictured) shelled by mortars and artillery. Halilović’s book was a huge success in Bosnia. But it wasn’t just the book itself; it pointed, like the arrows, to where we can look for a narrative beyond the ones offered in history books. There’s Nedim recalling how they handed his favorite book, Hedgehog’s Home, from one hand to the other during the siege. Or Mela’s white, pointed ballet shoes that would never be made again after the war. A reminder that there isn’t and never will be a complete truth to what war is (or was). We all have our own truths that can draw an overwhelming picture of a society in (and after!) war. “Not only in Bosnia, but around the world, the children’s point of view on war is nowhere to be found,” Halilović added. Beyond the online platform for the narratives, the idea for a museum was born. “It was a challenging journey. We weren’t museum professionals,” Halilović remembered. Budgets were limited and they set their goals high. Even though he wasn’t a museum professional, his career was moving along the way of cultural development of Sarajevo. Halilović grew up to be a young entrepreneur at the age of 16 and started several companies as well as NGOs. He is the author and editor of several books, including the monograph Sarajevo – My City, a Place to Meet in 2007, which became the gift that the Mayor of Sarajevo hands out to official guests. Years later, in 2016, the War Childhood Museum still had no physical space where the exhibits could be displayed. The promised support never materialized. On the day the supporting measures should have been passed, the proposal was suddenly withdrawn. It just wasn’t important enough. No BBC, CNN or other media coverage of this “unique and first-of-its-kind museum in the world” was enough. The War Childhood Museum seemed to be written off. It was a hard blow for Halilović and his team. “We just can’t beat the system,” he told journalists at the time. And this despite so many enthusiastic people wanting to be part of it, many for the first me in their lives for a cultural and activist project like this. “It still wasn’t good enough,” Halilović said. The future seemed uncertain. 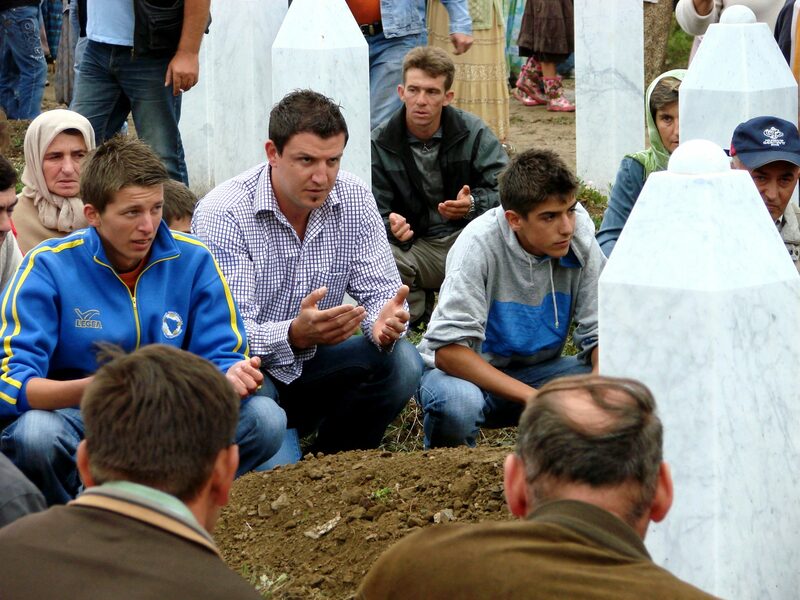 Bosniaks mourn the victims of the Srebrenica massacre at a reburial ceremony in 2007. Fast forward to the end of 2017. The War Childhood Museum is built on a physical location, was officially recognized by the PACE (Parliamentary Assembly of the Council of Europe) and won the Council of Europe Museum Prize for 2018 – one of the highest types of official recognition for museums in Europe. It was the first time in 40 years that a museum from the region received an award of this kind. The museum has grown and today includes some 4,000 pieces, requiring outside experts and massive engagement; Halilović himself and his team focus solely on the project now. “That such a project could happen in a country like Bosnia was incredible,” Halilović enthused. Finally, we’re in the present, in 2018. Final recognition came when Halilović was the first Bosnian to be included in Forbes’ “30 under 30” list of the most influential people in the world. WCM now has 20 employees from several countries, continually developing new ideas to what the museum should be. “We want to become the biggest archive on wartime experiences,” he says, not just in Central Europe, but beyond. Besides material from Bosnia and Herzegovina, the museum has documented wartime stories by child refugees from Syria stationed in Lebanon, and also in Ukraine. “We want to become an authority in our field of work,” he said. Halilović has meanwhile become an authority in this field, he helped found in the first place. He is regularly invited as speaker to conferences, and presents and teaches at universities around the world, including Northwestern University (US), Columbia University (US), Toronto University (Canada), Kyoto University (Japan) and Maria Curie-Skłodowska University (Poland). Halilović is also a member of the Global Shapers Community, established by the World Economic Forum, and of the WARM Foundation focusing on conflict research, and he’s a One Young World ambassador. I can picture him, fishing for Wi-Fi in Kenya, where, after a long day of work, he answered my questions. I didn’t ask what he was up to now, but maybe he’s collecting more stories om some new “lost generation?” Perhaps, with Jasminko Halilović, they will see that they are not that lost after all.